The members of the first reinforcement were critical in the expansion of the Mission, important relationships with the royal family and, through the efforts of missionary William Richards, the development of a Hawaiian constitutional government. William & Clarissa Richards and Charles & Harriet Stewart (and their dear friend Betsey Stockton) were assigned a hale pili (thatched homes) on Missionary Row. Missionary Row was Diamond Head side of the present wood frame building at Mission Houses – it fronted along what is now King Street. The interior of each of the houses was one large room with no floors, but the “ground spread with mats.” Most of the furniture in each of the houses had arrived with the individual family in the reinforcement. In 1831 with Lorrin Andrews, Richards helped to build the high school at Lahainaluna on the slopes above Lahaina. In 1838 the king asked him to become a political adviser; he resigned his position with the mission and spent his time urging the improvement of the political system. Richards was instrumental in helping to transform Hawai‘i into a modern constitutional state with a bill of rights (1839) and a constitution (1840). In 1842, he went abroad with Timoteo Haʻalilio as a diplomat seeking British, French and US acknowledgment of Hawaiian independence. William Richards later became the Minister of Public Instruction in 1846 and worked with the legislature to make education a legal mandate. Hawaiian Mission Houses Historic Site and Archives is in the process of reconstructing the Richards hale pili. The Hale Pili o na Mikanele is a non-traditional hale, as many activities took place here and missionaries did not separate gender activities into different buildings. When the Pioneer Company of American Protestant missionaries arrived in the islands (April, 1820,) through the kindness of some of the traders living in Honolulu three grass houses were offered to the five families. It is believed that these houses stood near the site of the McCandless building, at the corner of King and Bethel Streets. 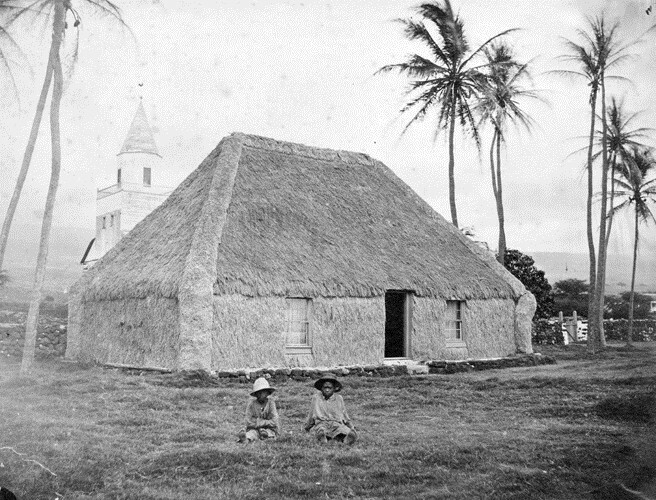 About 3-months after their arrival, Boki began building hale pili for the missionaries. There were three hale connected by a long covered lanai with a fourth hale used as a storage room, separated from the rest.